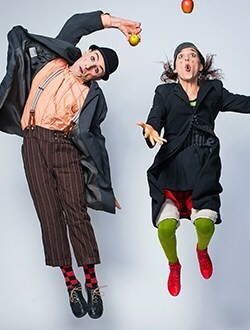 Acrobatics, apples, and an accordion: Pss Pss is a delightful clowning duo that will have anyone laughing despite themselves. Camilla Pessi and Simone Fassari are true entertainers, and they channel the spirit of Chaplin and Keaton as two lovable, bumbling clowns. They start off slow, throwing an apple to each other, balancing it on their heads, and using their facial expressions to tell a story. They hug often and she is always reluctant to let go, clinging on to him like an overgrown child. This running joke is flipped on its head by the end of the show, and Pessi is literally flipped on her head as she balances upside down, her head on top of Fassari’s, and they stand head to head not even holding hands. They perform a few of these shocking feats, all the while infusing their performance with their quirky humour and animated facial expressions. There are also some simpler tricks that they try to perform but fail, and this is equally entertaining. They recruit an audience member to help when a bar lowers from the ceiling and Pessi struggles to reach it. He was a really good sport as she climbed up him to stand on his shoulders. Still unable to reach, they get a ladder and bring it on stage after walking it over top a few rows of the audience, forcing them to duck down. They open the ladder onstage, but it’s upside down and they struggle to see how this will help them. More hilarity ensure before they both make it up to the hanging bar, awkwardly sharing the space and performing impressive acrobatic manoeuvers. This dynamic duo has it all: physical prowess, the ability to convey so much with a single glance, and the gift of silent, subtle comedy that elicits gleeful peals of laughter. Tremendously entertaining for all ages, this show is pure joy.